Couples want to invest in what will last. Pictures are one of the mementos that have yet to go out of style and lately, prenuptial shoots or engagement sessions are in vogue for to-be-wed couples. What are prenups or e-sessions? 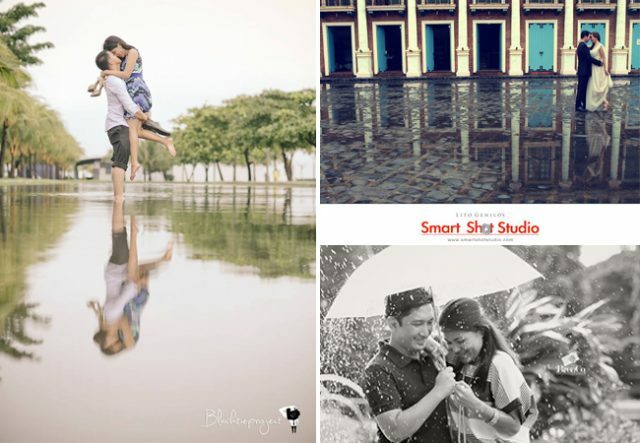 These are pictures taken pre-wedding, usually themed, that showcase the personality of and love between a couple. Basically, this is something fun that engaged couples can do before their wedding proper. If you’re thinking about doing a prenup then the first problem will be where to start. There are definitely a lot of couples who share the same hobbies, same passions or the same professions. You can pick your prenuptial theme by thinking about what you two have the most in common and go from there. No matter how well you know your future spouse, sometimes it is hard to pinpoint exactly what kind of prenuptial or e-session theme will be able to encapsulate who you are as a couple. Here are some suggestions of popular prenuptial themes that have been done in the past that you might want to use as inspiration for your own theme. A beach themed prenuptial is perfect for a couple who loves the sea and the sand. Not to mention, pictures taken by the shore usually turn up breathtakingly beautiful and bright. The Philippines is ripe with beaches to pose on. Another common element in the Philippines, there are couples who take advantage of the rain by incorporating it into their themes. The end products come out not only unique but romantic. Go hiking or trekking? A couple who enjoys spending time in high places and going on adventures might want to use their e-session as an opportunity to bask in the best of what nature has to offer. You can take your photos by a hidden spring or creek or explore a wood-land or forest. There are beautiful parks in the Philippines waiting to be explored for an outdoor prenuptial shoot. Get in touch with your inner child. When you’re with your special someone, you always want things to to be light and fun—taking pictures in a playground, riding a bike, or running around your own garden. It really doesn’t matter as long as you’re with the one you love. Much like candid photos, a fair is another way for a couple to reconnect with their inner child. There are a lot of beautiful sights at a fair. A whimsical and playful couple may opt to have their e-session taken on a carousel. A romantic couple may want to be alone atop the Ferris wheel. There are also plenty of other rides and stands to pose in for a couple who loves the amusement park. Did you ever think you and your future spouse were born in the wrong era? Now is the time to enter a time machine and step into a time you’ve longed to live in. Whether you want to go back to the Victorian Era or the 80’s, dress up and choose a setting that will best fit your period of choice. Other than period prenup themes, there are also some taken in historical places. Whether in casual or formal wear, historical sites are also a popular e-session location. For example, Intramuros is also one of the most well shot places in the Philippines. Here are just a few prenuptials taken at Intramuros, Manila. The Philippines has its own café culture. It’s really no surprise that it has influenced the e-session themes as well. Moreover, a lot of couples met in a café or restaurant for the first time and opt to go for this kind of theme. Are you one of them? Sometimes reality just can’t encapsulate what a couple feels for each other. Luckily, we have wedding photography studios in the Philippines that can use special effects such as the use of editing software and Infrared wedding photography to give you the prenuptials of your dreams. This is also a good option for couples who want to go abroad but can’t afford to have their photos taken outside of the Philippines. Want a picture in a foreign country? To be part of a painting? Maybe this theme is for you. Can’t get enough of the city? Using a thriving metropolis as a backdrop and prop makes for sophisticated photographs. The city skyline is dramatic, romantic, and modern. Most Filipinos couple go back home to their provinces to get married. Having your prenuptials in your hometown is a way to share your childhood with your future spouse. Homey and rustic themes lack formality, making this suitable for couples who enjoy a lot of light, earthy-tones, and just being very comfortable in each other’s company. There are no hard and fast rules to follow—you can combine themes and talk about how you want to go about it with your future spouse. The point of a prenuptial shoot is that it is another way to make lasting memories and bond with your future partner. For more prenuptial ideas and promos: feel free to explore the photographers in our wedding supplier directory. Kasal.com has reputable wedding photographers you can browse through to get: affordable wedding photography packages and avail of wedding prenuptial promos.